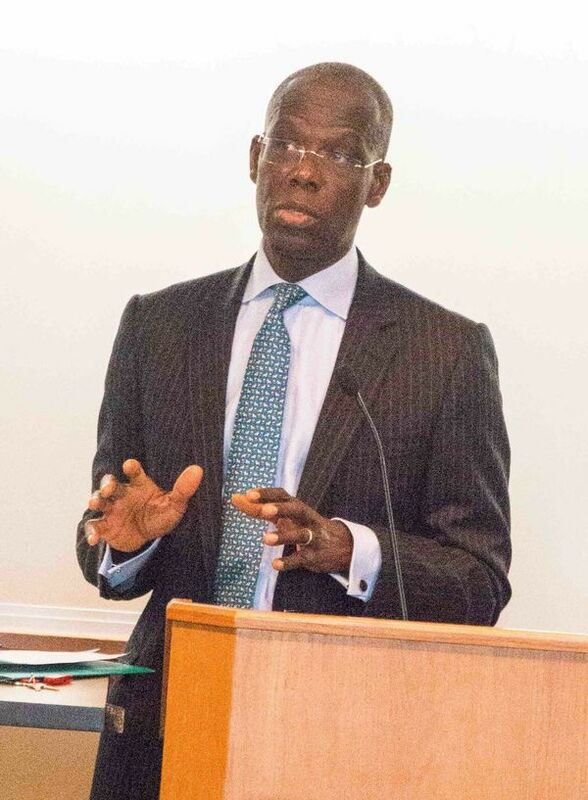 Michael K. Addo, director of Notre Dame Law School’s London Program, speaks to students on Sept. 12. // Photo by Alicia Sachau, Notre Dame Law School. Notre Dame Law School prides itself on educating a different kind of lawyer, and part of that formula includes educating students with an international perspective. Michael K. Addo, the new director of the Law School’s London Program, was in South Bend last week and spoke to students about the benefits of studying in London. Eight students who spent all or part of the 2016-17 academic year in London helped Addo make his point. Several called their time in London their “best semester of law school” while talking about interning with members of Parliament, soaking up London’s culture, and traveling to The Hague and other European landmarks. One of the reasons law students, in particular, benefit from studying in London is that English law is the basis for American law. The English system is also the mother of legal systems used in Australia, New Zealand, India, and other nations in the former British Commonwealth. “What better way to understand American law than to go to its roots? And its roots are in London,” Addo told students. Randy Kozel, associate dean for faculty development and professor of law, served as interim director of the London Law Program during the spring semester. Addo said studying in London – the United Kingdom’s legal center – also allows students to explore legal careers outside the United States and gain clarity on whether they want to work abroad. Notre Dame Law students are eligible to apply for internships while studying in London, and many of them work for law firms, corporations, nonprofit organizations, and government offices while studying abroad. Notre Dame’s London Law Program was established in 1968. It offers full-year and semester-long programs as well as an intensive summer program in intellectual property and technology law. The University’s classroom building, Fischer Hall, is located on the famed Trafalgar Square in Central London. Conway Hall, also owned by Notre Dame, has flats available for students to rent in the South Bank – a neighborhood in the heart of London’s cultural scene. Students have the option of finding their own housing in other London neighborhoods, too. Both 2Ls and 3Ls participate in the London Program. About 25 law students are spending this fall semester in London, and more than 40 are set to study there in the spring. Originally published by Kevin Allen at law.nd.edu on September 20, 2017.